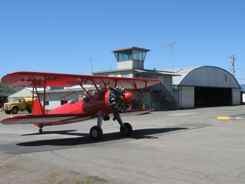 Most of our pilot friends call it just Schellville or Schellville Airport Sonoma. 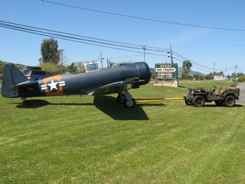 It's official name is Sonoma Valley Airport. 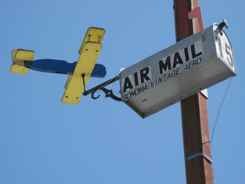 The pilots that hang out there have dubbed it the Schellville Antique Aerodrome. It's a fun little airport to visit. It IS small, but they have some great antique airplanes to see. 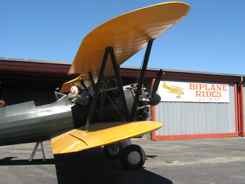 How would you like to see a 1918 Curtiss Jenny? They are flyable, and if you're lucky you could see them. The hangar doors are open on most display days. We stopped by on a non-display day, so we don't have a picture of either for you yet, but even on a quiet day you can see antique airplanes in hangars and on the field. Their Display Days are on the second weekend of the month. 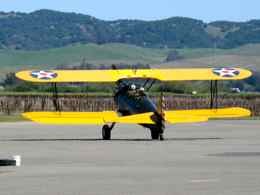 What kind of antique airplanes can you hope to see? Lots of the little guys... a Model 90A Monocoupe, a 1938 Ryan SCW, a Fairchild 24R46, a 1938 Ryan SCW and of course a few Stearmans, WACOs and little warbugs. How about an SNJ and T-6... I know they're pretty much the same, but that's how they're dressed out. You can even see a P-51 Mustang and a P-40N Warhawk. 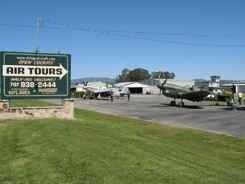 To see their photos and their list of the aircraft hangared there go to Sonoma Valley Airport. 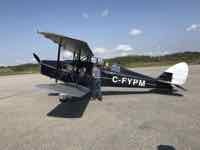 You can fly in some of the aircraft owned by the Vintage Aircraft Company. 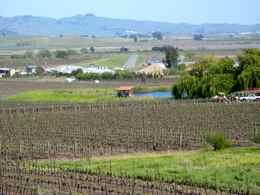 They'll take you on flights over the vines of wine country, or if you prefer, out over the Pacific or south to San Francisco. You can fly in a Stearman, an SNJ, or even (if you're lucky) in their P-40 Warhawk. The Schellville Airport Sonoma is located north of San Francisco Bay, about 6 miles north of the Highway 37/121 intersection. From San Francisco, take Highway 101 north across the Golden Gate Bridge to Highway 37. Turn left on Highway 121 for about 6 miles. From the Oakland and the East Bay you can take the Richmond/San Rafael Bridge to Highway 101 and follow the directions above, or take Interstate 80 to Highway 37 in Vallejo. Follow Highway 37 west to Highway 121. These directions put you into California Wine Country. Jacuzzi Winery is just about a mile south of the airport. Stop in for a taste and ask them about the J-7. Ever hear of it? You probably know the Jacuzzi name from the whirlpool tubs they produced, but early on, they were into aviation. The Jacuzzi Brothers developed a "Toothpick" propeller. 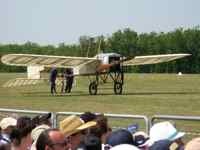 America's first military planes utilized it in WW I. The Jacuzzi J-7 was the first cabin monoplane built in the U.S. It was adapted to deliver mail. For a brief time it ferried passengers to Yosemite. And dad said. "No more airplanes." You can get the history from the staff at the winery and buy a bottle of Jacuzzi Cabernet Sauvignon that has a photo of the Jacuzzi J-7 on the label. Climb their tower and you can get view of the airport. For a better view of the airport, head further south and sit on the patio at Viansa Winery for a great view of the approach to the airport. For another angle go just north of the airport and across the highway, to visit Gloria Ferrer Winery.... buy a bottle of California Sparkling Wine and sit on their patio. You will be looking right down one of the runways from a great vantage point. Two of our great loves.